Steve House just contacted us from Iceland. 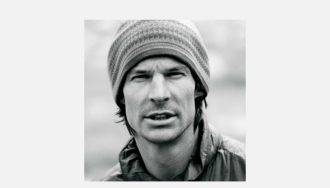 He wanted to share his opinion regarding the future of the Piolet d’Or and how it might better reflect the values of hard alpinism. Marko Prezelj initiated this discussion by declining to accept the award at this year’s ceremony. Those in the know can skip straight to Steve’s letter. Otherwise, please take a moment to familiarize yourself with the issue before reading Steve’s response. I am happy to hear Phillipe Descampes declare that this is a good time to have a “very open discussion” about the value and the future of the Piolet d’Or award. With the withdrawal of the GHM and the recent history of the award, the time is right to talk about the future Piolet d’Or. To this end I think it would be constructive to try and forget the award’s history and examine it abstractly, as an idea, as if we were to create it anew. Also, I think hard alpinism is truly without a clear voice. Journalists often do not have the experience to understand what hard alpinism is really like. And I have seen definite proof that they often don’t know which questions are the right questions to ask. When you talk about a climb, like my ascent of the Rupal Face in 2005 for example, I honestly believe there are only 50 people in the world that understand what we did. Truly understand. And not one of those people is a journalist. The right type of award might help convey the experience of hard alpinism more clearly. Now, to the definition. An award for climbing should be defined as carefully as possible so both the nominees and the audience understand what is being praised. It is beyond me to write such a thing, but I imagine something like a mission statement for the Piolet d’Or. I would be adamant that it not be done by journalists or other observers. I believe, as Marko does, that these groups have a very bad history of identifying what is the so-called “best ascent.” The definition for the award should be crafted by an appropriate committee of top climbers. I believe there should be only one award for the best ascent of the year. I think that if you fracture the award (as is the case with the Piolet d’Or d’Asie or with the American “Golden Piton” award) then you fracture its value. The Piolet d’Or is valuable and important because it is the international award. The best way to make it meaningless is to divide it into as many pieces as possible. What is the likelihood of the ascent being repeated? Why? Did the team carry anything other than the minimum equipment necessary for climbing? If so, what? And why? Did the climbers use a style that was appropriate to the objective? Had the objective been attempted in another style previously? What was the history of those previous attempts? Is the route an independent line? Or a variation? What was the level of commitment of the team while on the climb? Was retreat often difficult, or always easy? Did the team build on their own previous attempts by reusing old equipment left on the mountain? These questions, and others I have not yet imagined, need to be incorporated into the foundation of the award because in my experience they were asked too infrequently by past juries of the Piolet d’Or. I also agree with Marko’s assertion that there should be an attempt to remove the feeling of competition between nominees and inject a feeling of cooperation and celebration. In years past I noticed that some of the nominees had a very strong feeling of competition with the other nominees. I believe that is a negative byproduct of the award in its current state. The Piolet d’Or could foster the health of alpinism by creating a setting to bring together the top climbers from around the world and allow them to talk and climb (and drink and laugh) together. I think we would find out that there exists a pool of communal experience and knowledge that would be much greater than anything any one nominated team has. This brings to mind the BMC Scottish winter meets. I can think of a number of important climbs that were done because climbers met and talked and climbed together in Scotland. But I cannot think of one climb that was done out of a collaboration born at any Piolet d’Or ceremony. Future Piolet d’Or ceremonies should allow several days time for this climbing and the media should be expressly excluded from this time. I think there is an area of compromise here that has not been recognized. Alpinists do need the media to convey the ideas and emotions of climbing. Alpinism needs a voice. We should keep the media involved in the award itself. The role of the journalist is to act as the communicator between the actor and the audience. But I feel very strongly that the media, including the editors of Montagne Magazine, should be completely excluded from the judging. There are several possible ways to construct a jury without journalists. One might be to include the nominees themselves in the voting. Actually, an award from one’s own peers is much more valuable that an award from a jury of observers. Let us take this opportunity for growth and see the Piolet d’Or award evolve. It should be a peer-based award. It should celebrate all the great ascents of each year. It should be a place for those climbers to meet and share information, ideas, and experiences in a cooperative setting that will develop into the great ascents of the future. And the climbers and the media should join together to tell this story to the public. That is a Piolet d’Or we will be proud to support and participate in.